i wanted to write a little guide on how to wire your LCD Display Board to the Raspberry Pi Zero for testing purposes. It is for testing only, as you will change the wiring later, when you've implemented the Power Supply (PowerBoost or alternative). As you can see, your Display Board should have 4 wires. You will need to solder on 3 of them. Red: V+ or 5v input. This is where your LCD gets its power from. Black: GND or Ground. This is the ground or - if you will, of your LCD. White: One of 2 Video Inputs. This is where it gets it's video signal from. Yellow: The second Video Input. Most LCD Boards got 2 Inputs to change between 2 sources. 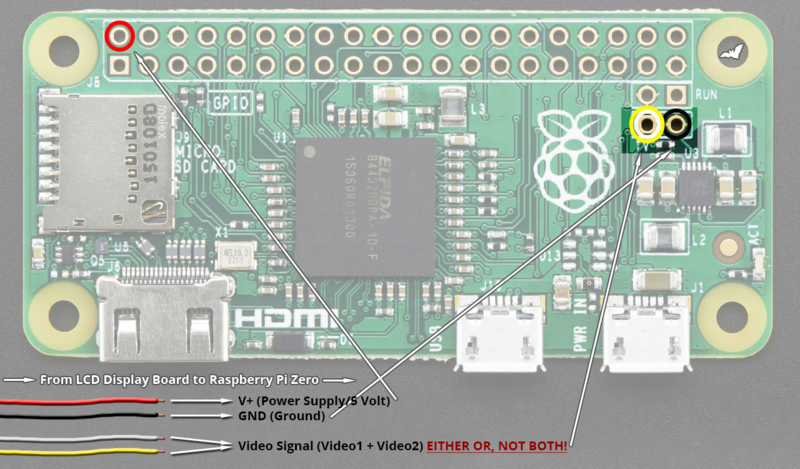 As wrote before, you will only need 1 of those Video Inputs to be wired onto the Pi0! NOT Both! or just solder on the other wire (Yellow/White) and test it with this one. I know a lot of you also solder the Red and Black wires onto the Pis USB Power Supply pads. You should refrain from this. Sure, if works and it usually will not cause any problems in most setups. But those are the pads for SUPPLYING the Pi with its needed power, not the pads that the PI has to supply modules and stuff. Those are located in the GPIO Area and those are there for a reason. especially during the startup phase. This can cause your Pi to turn off during boot and corrupt your SD Card. Again, this is unlikely but why take a risk if you can avoid this by simply using the Pins that are meant for this stuff? Well, that's it. This is how you wire up your LCD Board to the Pi Zero for testing the Display. As wrote before, this wiring will change, as you will solder the Red and Black wire to your Power supply later, in the final build. Last edited by Fleder on Wed Jul 25, 2018 10:26 am, edited 1 time in total. Either works though. Good work man. I'd have to disagree. The closer your ground is to the video signal, the better. Camble wrote: I'd have to disagree. The closer your ground is to the video signal, the better. @SidSilver Reduced video noise. I get noise on my LCD when the ground is connected elsewhere. Thanks for this tip, Fleder. Temporarily wired my 5V mod Gearbest screen this way and it fired up like a champ. What is the benefit of running the power from the Pi vs the power strip? BigOlTexasBoy wrote: What is the benefit of running the power from the Pi vs the power strip? This is, as I clearly wrote in the OP, only for testing the screen. You will want to get the power from the power strip, in your final build. But before you wire everything together, it is easier and faster to test your display with this method. This wiring is not meant to be used in the final build! Right, I saw the OP. I've seen people leave this configuration. So do you recommend powering the display from the power strip when I put it all together. I only ask because I've read recommendations to not power things from the Pi and recommendations to keep the ground close to the video out. Just want to find out the best way to do it before I get started.